In this stunning new book, Malcolm Gladwell takes us on an intellectual journey through the world of "outliers"--the best and the brightest, the most famous and the most successful. He asks the question: what makes high-achievers different?His answer is that we pay too much attention to what successful people are like, and too little attention to where they are from: that is, their culture, their family, their generation, and the idiosyncratic experiences of their upbringing. Along the way he explains the secrets of software billionaires, what it takes to be a great soccer player, why Asians are good at math, and what made the Beatles the greatest rock band. Gladwell argues that success is tightly married to opportunity and time on task. He states that it takes approximately 10,000 hours to master something and that gives me comfort. It helps me feel better about my many failures at initial attempts to master things (like glazing pottery, algebra, Salsa dancing, skiing and sewing... to name a few). I kept thinking, "I've just got to put in more hours if I want to do better." While I can see a different way of spinning the data provided to support Gl Gladwell argues that success is tightly married to opportunity and time on task. He states that it takes approximately 10,000 hours to master something and that gives me comfort. It helps me feel better about my many failures at initial attempts to master things (like glazing pottery, algebra, Salsa dancing, skiing and sewing... to name a few). I kept thinking, "I've just got to put in more hours if I want to do better." While I can see a different way of spinning the data provided to support Gladwell's argument, I didn't care. In a rare moment, I found myself not wanting to argue. : ) Instead, I found myself reflecting on things that have felt like lucky opportunities in my own life. This reflection was very humbling. Moreover, I felt the text tugging at the need for greater equity. What could all the people with limited opportunities do if given greater opportunities? Think Darfur. How many people who might have come up with the cure for pancreatic cancer been forced to spend their time standing in lines waiting for clean water or food? My own personal experience as a teacher of refugees reflects Gladwell's primary thesis. Many of my refugee students are pre-literate. They have not been given the opportunity to gain a formal education. As a result, there are many well-intended, but misinformed people who place these students in special education courses or deem their I.Q. low, diminishing their opportunities even more. The students I teach are hungry for skills and spend hours outside of class practicing. They make huge gains despite earlier opportunities denied them. While many will not go on to big colleges out of high school, I feel like given enough opportunity and time they could make it there. Sadly, many have families who depend on them to work to help financially support the family. (Yet, another limited opportunity to spend time focused on developing skills.) In the past week, I have shared Gladwell's thesis with my students. We have applied the 10,000 hours to master a task to reading and writing. I remind students that if we don't get our 10,000 hours this year together, they must continue on their own. I remind them that it IS possible to move forward if they are focused and keep adding hours of work to their reading and writing. We even write on the board how many hours left before we are masters. "2 hours down, only 9,998 left to go. "Friday, I had a student from Somalia smile and ask, "So it's not true that white people are smarter than black Africans? They just get more chances to read?" Imagine my pleasure when I could respond, "YES! That's correct. You are just as smart as any white kid in this school. It's just that some of them have been reading for years and you are just getting started." Thank you for your work Galdwell, it is salient in today's political conversation surrounding education (especially for our most vulnerable students who have been given the fewest opportunities). When I think about Malcolm Gladwell, the first phrase that comes to mind is "less than meets the eye." At first glance, his work seems thoroughly researched, even visionary at times. Beginning with a few maverick, counter-intuitive insights, he often ends with an affirmation of consensus, but it is a consensus that has been broadened by investigation and enriched by nuance.On second look, however, I'm no longer sure any of this is true. What first appeared to be new insights are nothing but fami When I think about Malcolm Gladwell, the first phrase that comes to mind is "less than meets the eye." At first glance, his work seems thoroughly researched, even visionary at times. Beginning with a few maverick, counter-intuitive insights, he often ends with an affirmation of consensus, but it is a consensus that has been broadened by investigation and enriched by nuance.On second look, however, I'm no longer sure any of this is true. What first appeared to be new insights are nothing but familiar landmarks, previously unrecognizable because of the adoption of a deliberately mannered perspective; even the once apparent breadth and nuance now seem triumphs of language over logic, the apparent inevitability of his arguments an illusion conjured by the spell of his limpid prose.Take one small example from "Outliers." With a flurry of standardized test statistics, Gladwell makes the case that the traditional summer vacation--however rewarding it may be for the middle class--is just not working for the poor. (I'll concede the point, for the sake of argument, but any high school teacher will tell you how suspect conclusions drawn from such statistics can be.) He then presents a sustained anecdote about a successful all-year-round secondary school in a poor neighborhood. His conclusion? We should go to school year round. Sounds reasonable, right? But what about a more obvious solution: as a society we could decide to work together so that summer can be a learning experience for the poor by instituting a myriad of basketball camps, music camps, art camps, chess camps, traditional summer camps, etc., held at schools, community centers, and city parks, and staffed by college students, artists and teachers from the neighborhood. Gladwell often reminds me of the last panel of a Dilbert cartoon: two panels of plain-speaking criticism, followed by one panel of resignation. And no real insight, no real hope for the future. I know, you don’t think you have the time and there are other and more important books to read at the moment, but be warned, you do need to read this book.There are a number of ways I can tell a book will be good; one of those ways is if Graham has recommended it to me (how am I going to cope without our lunches together, mate?). And there is basically one way for me to I know that I’ve really enjoyed a book, and that is if I keep telling people about it over and over again. Well, not since Pred I know, you don’t think you have the time and there are other and more important books to read at the moment, but be warned, you do need to read this book.There are a number of ways I can tell a book will be good; one of those ways is if Graham has recommended it to me (how am I going to cope without our lunches together, mate?). And there is basically one way for me to I know that I’ve really enjoyed a book, and that is if I keep telling people about it over and over again. Well, not since Predictably Irrational (also recommended to me by Graham) have I gone on and on about a book to people. First to Ruth over lunch, then to mum on the phone, and then the kids after they had just gotten out of bed in the early hours of the afternoon – my poor children, I’ve told them virtually the entire book.Now it is your turn.As a culture we tend to believe that people who are successful (people like Mozart, Bill Gates, The Beatles) all are ‘self-made-men’ and have risen to the summit of achievement on the basis of some incredibly special power they have and that we do not. It is a comforting thought, in some ways. If we have not done as well we are hardly to blame, because we just didn’t have that certain something. We don’t have the thing that sets them people apart from the crowd. And in this cult of celebrity we even get a chance to live vicariously in the reflection of their glory. Perhaps we can never all be Lady Di, (at least, not in public) but we can all attempt suicide with a pate knife and get into colonic irrigation. John Safran talks somewhere about a guy he knows saying to him that the only reason John made it and he didn’t was because John was Jewish. John then talks about how much hard work he had to put in to becoming successful, none of which relied on the mythical leg up he would have gotten from some secret Jewish conspiracy. This book isn’t about Lady Di, but it is about a series of biographies of people who have become incredibly successful. The biographies are generally told twice. The first time in a way that confirms all our prejudices about self made men and then in a way that makes sense of the success in ways we may find much more uncomfortable. I really struggled with this book – I loved every minute of it, but I still felt remarkably challenged by it. It was very hard not to think of my own life while reading this book. And this did not make me feel comfortable.I guess we are all fairly predictable, and one of the things that makes us especially predictable is that we generally like to have our prejudices confirmed. We buy books that tell us over and over again what we already know and believe. The Left Behind series is just one such example, as are most self help books. And I’m as guilty of this as anyone else. But there is a much better sensation we can get from a book, although this is much more rare. It is when the person you are reading starts telling you the deeper reasons why your beliefs are valid and not just based on prejudice. I have always believed talent is another (although, less apparent and all too vague) word for hard work. I’ve also believed that we are products of a range of different variables too complex to know in any real detail. This book confirms those prejudices.First he talks about ice hockey and a fascinating fact about the birthdays of the best players. They are all born at around the same time of the year. It is as if there is a cut off date for when you will be a professional ice hockey player – and, in fact, there is. The short version is that if you are born on the wrong side of the date they use to group kids into age levels you are likely to be a year younger than the other kids you are playing ice hockey with and therefore a year smaller than them too. That is going to make them look like they are better players than you are – and they will be too. A year at 10 is a huge difference, a huge advantage. And then we compound that advantage, by giving the older kids more practice, more experience in games and then more experience and more practice until there is no way the kid who happened to be born on the wrong side of the cut off date has any chance of catching up.The point he makes strongly here and repeatedly in the first part of the book is that there are other factors to success that are more than just ‘natural ability’. In fact, he does not believe in ‘natural ability’ – only in effort and time. Essentially he shows that if you put in 10,000 hours on any task you will be highly proficient at that task. Innate ability does not exist and ability is actually a function of effort expended. This is both liberating and incredibly challenging. Liberating because success is related to the effort you put in (and I think you should believe that is true even if it isn’t – it is the myth of Sisyphus, the only way we can really cope with the world is to believe our efforts have meaning). Challenging, because ultimately we are responsible for our own success as we are directly responsible for how much effort we are prepared to put in.The second great theme of this book is that where you come from matters. The culture that we are from has a remarkable impact on the rest of our lives. For example, if you are from a working class background you are much less likely to approach life with an attitude of ‘entitlement’. When people in authority speak to you, you are probably less likely to question them. In fact, you might believe you should defer to them. You are probably more likely to believe rules exist for a reason and that rules can’t be changed and can’t be moved. People from the middle class are much more likely to see rules as things that can be shaped or changed or ignored to make their life more easy or rewarding. Having come from the working class, even a particularly radical end of it, I can still see aspects of this deference in my own character and this was perhaps the most challenging part of the book for me.The other challenging bit was the part about the Hatfields and McCoys. As a Northern Irish boy, even if I’m not as obsessed with ‘honour’ as I might have been, this does make sense of things I have wondered about for a long time. The solution might be a little too neat, but the Irish, particularly the Northern Irish, are far too likely to feuds that are intractable and recognising that that might have cultural roots beyond the excuse of religion is utterly fascinating to me.The lessons of this book can be put into a brief sentence: success depends on a series of cultural and other factors that are mostly beyond your control – however, the thing that is totally within your control about success is how much effort you put in. And the more effort you put in the more likely you will be successful. They are directly proportional and we should all praise work as the key thing that really makes us human.I loved this book. I noticed that Ginnie points to a pilot who disputes some of what Gladwell says about culture and plane crashes, but this is a minor point. His bigger point about culture and plane crashes still stands and is remarkable. If you have kids, read this book – it will give you hints on how to bring them up with perhaps a modest sense of entitlement – it could make all of the difference. Ginnie also has a link to an article with a photo of the man himself – I was saying to the kids yesterday that I would give a couple of toes to look nearly as cool as he does, but I think it would take more than just toes.Look, what can I say? Read this book, it is life altering. Well, maybe not life altering, but a delight nonetheless. Didn't exactly read this book - Joe and I listened to it in the car on the way home from visiting family for Christmas. I really enjoyed it, and was very fascinated by certain parts of it, especially the sections about the Beatles, computer programmers and Korean co-pilots.But my enjoyment of the book was marred by the glaring absence of any well-known female "outliers." By chapter four or so, I noticed it and mentioned it to Joe, and then it just kept getting worse to the point that it was comi Didn't exactly read this book - Joe and I listened to it in the car on the way home from visiting family for Christmas. I really enjoyed it, and was very fascinated by certain parts of it, especially the sections about the Beatles, computer programmers and Korean co-pilots.But my enjoyment of the book was marred by the glaring absence of any well-known female "outliers." By chapter four or so, I noticed it and mentioned it to Joe, and then it just kept getting worse to the point that it was comical and distracting. Man after man after high-achieving man was featured. Any time a woman was mentioned, it seemed she was a wife or mother helping to boost a high achiever to success - or, in one case toward the end of the book, a somewhat slow female math student that a male professor had videotaped trying to figure out a math problem. By the time we got to that vignette, it was so ridiculous that Joe and I both started laughing, and Joe joked that "the only woman in the book is dumb - but persistent. "When we got home, I Googled "Gladwell Outliers sexist" or something like that and found that several female bloggers and columnists also were ticked off about it and had taken Gladwell to task for it. Gladwell doesn't strike me as a raging sexist, so my guess is that he is so used to being a male in this world and constantly hearing about and identifying with male high achievers that maybe he didn't even realize what he was doing. I noticed that he gave a pretty weak response when questioned in an interview about his omission of women - he claimed that he had not omitted women because he mentioned his grandmother's story at the end of the book, in the epilogue, I think. Um, okay. Malcolm Gladwell's new book reads like a series of cocktail-party anecdotes. Whether the book is a mere fluff piece or something more is open to debate. At its heart, it has two themes: (1) That success depends not just on talent but opportunity, and (2) that success (and failure) also depend on the cultural legacies we inherit from our forebears. Boiled down, here are his essential ideas:OPPORTUNITY1. Luck matters. Hockey players who happened to be born between January and March were disproport Malcolm Gladwell's new book reads like a series of cocktail-party anecdotes. Whether the book is a mere fluff piece or something more is open to debate. At its heart, it has two themes: (1) That success depends not just on talent but opportunity, and (2) that success (and failure) also depend on the cultural legacies we inherit from our forebears. Boiled down, here are his essential ideas:OPPORTUNITY1. Luck matters. Hockey players who happened to be born between January and March were disproportionately represented in professional hockey leagues. From an early age, these players were the oldest in their age bracket, and therefore bigger and more coordinated. Coaches selected them for better training and playing opportunities, and overtime, success bred success. Likewise, students who happened to be older for their class scored higher on math and science tests than their younger classmates, and were more likely to be picked for "gifted" and other advanced programs. 2. Even smart people need 10,000 hours of practice before they master a skill. Those that can get those 10,000 hours during childhood are a step ahead. Bill Gates, Steve Jobs, and The Beatles all had unique opportunities to have lots and lots of practice in their specialties at an early age before becoming successful.3. After 120, increases in IQ are less important than creativity and "practical intelligence" -- knowing what to say to whom, knowing when to say it, and knowing how to say it for maximum effect. A lifelong study of geniuses showed they were no more successful than the average population. Nobel laureates are just as likely to come from City College of NY, Augsburg College, or Gettysburg College as they are from Harvard.LEGACY4. Rural Americans in backcountry states -- Kentucky, Tennessee, North & South Carolina -- inherited a "culture of honor" from their Scotch-Irish forefathers. These herdsmen warriors brought with them a willingness to fight in response to the smallest slight. This led to a pattern of bloody and violent feuds between families across the Appalachian states. (Think Hatfields vs. McCoys.)5. Korean Airlines had an unusually high rate of plane crashes because of the Korean culture's extreme deference to superiors. Junior pilots were reluctant to directly contradict their Captain on a flight, even in the face of grave error. This explains, for instance, the Korean Air Flight 801 crash in Guam in 1997. When the airline hired a specialist from Delta to retrain the pilots to speak more transparently, their safety record went up dramatically.6. Asians are good at math and science because their ancestors planted rice paddies. Rice farming was more labor intensive than Western agriculture. Asians have inherited this stick-with-it-ness that allows them to excel in math and science, where perseverance is mandatory.7. Unlike rice paddies, wheat or corn fields need to be left fallow every few years. Early American educators adopted this principle toward schooling - that students must not be exhausted. Hence, the long summer vacation, a distinctly American legacy. But this legacy is counterproductive, because kids tend to forget things over the summer. Kids who go to schools with shorter summer breaks tend to have higher test scores. Here's what I wrote earlier. I have to admit to the more I think and talk about the book, the less I think of it. It all seems too superficial.A pretty interesting book, albeit with not quite as many "knock me over with a feather" moments as Blink. It starts off with a bang, as he discusses amateur hockey teams and how it was noticed that virtually all the players on an Under-18 hockey team came from the first three months of the year. Turns out the age cutoff is January 1 in Canada, so the olde Here's what I wrote earlier. I have to admit to the more I think and talk about the book, the less I think of it. It all seems too superficial.A pretty interesting book, albeit with not quite as many "knock me over with a feather" moments as Blink. It starts off with a bang, as he discusses amateur hockey teams and how it was noticed that virtually all the players on an Under-18 hockey team came from the first three months of the year. Turns out the age cutoff is January 1 in Canada, so the older players (those born early in the year) advanced further due to their slight maturity advantage which continued to multiply, as they got better training, put on better teams etc.This subject hits close to home, as I am a soccer coach and heavily involved in my daughter's soccer league. My oldest has a birthday at the worst possible time, just a few weeks before the cutoff date, while the younger one has a birthday the month after the cutoff date. So far, it hasn't seemed to slow the older one's progress, but it is something I will certainly keep an eye on. Gladwell's suggestion is to have multiple cutoff dates, so other ages can play against others of the same age. Doesn't seem likely though.He also explores how the timing of your interests can really change things. Something as simple as how available computer time was to early pioneers like Bill Gates and Bill Joy. Certainly, in the late 60s and early 70s, the amount of keyboard time these guys had pales in comparison to what would be available just a few years before that. He also talks about a major law firm in New York that benefited from getting the kinds of financial cases the other law firms wouldn't deal with, only to explode in popularity as the money days of the 80s and 90s struck.I thought the book felt like it suffered from data mining, in that there didn't seem to be enough exploration of other equally successful groups that may not have had the same advantages. But still a fascinating look at what kinds of thing influence success, whether we think about them or not. People are criticizing this book because it is not a journal article. Well guess what: we're not all sociologists. I have read plenty of journal articles in my own field (law). I'm in no position to read journal articles in fields outside my own. Having a well-written piece of mass-market writing is just the thing I need to access this information.Another criticism of the book is that Gladwell is the "master of the anecdote." Well, it seems to me that ALL SOCIAL SCIENCE is in some sense anecdota People are criticizing this book because it is not a journal article. Well guess what: we're not all sociologists. I have read plenty of journal articles in my own field (law). I'm in no position to read journal articles in fields outside my own. Having a well-written piece of mass-market writing is just the thing I need to access this information.Another criticism of the book is that Gladwell is the "master of the anecdote." Well, it seems to me that ALL SOCIAL SCIENCE is in some sense anecdotal. Every survey (even a methodologically perfect one) is necessarily un-abstract and anecdotal: it is based on survey research from particular people, and there's no way to derive abstract rules governing society from that like math. This notion of how Gladwell is all anecdotal bothers me. So what? If a good anecdote gets you to look at a situation in a new way or makes a powerful point, that's excellent! Any writer worth his or her salt LOVES a good anecdote to grab the attention of the reader. I skimmed this book instead of reading it. I didn’t entirely love it.Although the author makes some interesting points, I find some of the correlations he tries to draw a little silly. Like the Italian community in Pennsylvania where people are healthier and live longer because they have a sense of “community” or the fact that Southerners react more violently to certain situations than Northerners because they derive from a “culture of honor.” Sounds like extrapolated horseshit to me, especially I skimmed this book instead of reading it. I didn’t entirely love it.Although the author makes some interesting points, I find some of the correlations he tries to draw a little silly. Like the Italian community in Pennsylvania where people are healthier and live longer because they have a sense of “community” or the fact that Southerners react more violently to certain situations than Northerners because they derive from a “culture of honor.” Sounds like extrapolated horseshit to me, especially considering the sample size. And when the author is making sense, I feel like he isn’t telling us anything we don’t already know. Like the fact that success breeds success, opportunity is key, practice pays off, etc. One of the few things I do find interesting, however, are differences noted in the way children are raised and the fact that some degree of entitlement being taught to them early can actually be beneficial as they mature into adulthood, mostly because they’d be able to use this sense of entitlement to demand higher salaries and better job positions.Regardless, this was my first experience skimming. I'm not sure I’ll do it again anytime soon. Well, it's official: Malcolm Gladwell has run out of things to say.His prose is still lively and entertaining, and he maintains his famous I-look-at-things-differently-than-anyone-else attitude, but "Outliers" has so little meat that it would have more appropriately been published as a magazine article.I think that the main value of reading Gladwell is that he plants a seed in your brain that encourages you to seek unconventional explanations for familiar phenomena. That's a very healthy thing, Well, it's official: Malcolm Gladwell has run out of things to say.His prose is still lively and entertaining, and he maintains his famous I-look-at-things-differently-than-anyone-else attitude, but "Outliers" has so little meat that it would have more appropriately been published as a magazine article.I think that the main value of reading Gladwell is that he plants a seed in your brain that encourages you to seek unconventional explanations for familiar phenomena. That's a very healthy thing, and I'm not trying to disparage its significance. But if you're looking for a book that provides meaningful insights, "Outliers" isn't it. Recommend to: If you like exploring phenomenon beyond their appearance and if you enjoy story-telling writings about factual subjects, here: successWhat this book is about: Here, the famous columnist, Malcolm Gladwell deeply investigates the topic of success and people or nations with far beyond average achievements whom he calls "outliers" to figure out what has contributed to their accomplishments.ProsThe way Gladwell observes and concludes is so enticing and far different from what you might Recommend to: If you like exploring phenomenon beyond their appearance and if you enjoy story-telling writings about factual subjects, here: successWhat this book is about: Here, the famous columnist, Malcolm Gladwell deeply investigates the topic of success and people or nations with far beyond average achievements whom he calls "outliers" to figure out what has contributed to their accomplishments.ProsThe way Gladwell observes and concludes is so enticing and far different from what you might think about why a phenomenon has happened. For example, see how these arguments might sound: 1. Chinese are good at math because of their way of sowing and reaping rice in the fields. 2. The flight number X crashed, because the co-pilot was Colombian. And any other Colombian in his place might have led to the very same outcome. Strange? Yes, is seems so, and Malcolm nicely shows how these seemingly unrelated events are tightly bound.So from the point of the way he see's things differently and actually tries to find real reasons behind events you'll find the book amusing and thought provoking.ConsThere are two major problems I have with this book. First, he nicely let’s say detects the roots from which success is grown and these roots he argues, are all mainly what we can have no part on cultivating or choosing. Things like the date of birth (which opens up opportunities for practice in cases he studies etc. ), or cultural background. But it would have been much nicer had he provided vivid guidelines on now that we can't choose the roots, how we can provide the opportunities and the environment caused by the roots.The other problem with some of his observations is that they can be potentially badly flawed or be results of what scientists say clustering. Namely, you look at a particular area with particular trends and specifications and you extend the qualities to the whole group in other areas. Or in situations I think, despite his keen observation and uncovering an aspect of an event, fails to see other dimensions as well. For example, in one part he says “Because of the limitation of lands in china, farmers had to be smarter and work smarter on their lands to increase production in contrast with their counterparts in America who used advanced machinery to increase the harvest and productivity. Now my argument: Haven't the Americans been smart to build such advanced machineries? :| All in all the book was often engaging and thought provoking and if you want to read it, have it read skeptically, for the book if not absorbed well because of the amount of emphasis he seemingly puts on chance (things we have no will to choose on our own like parents, birthday, cultural background, etc.) might end up discouraging. The book's message though I think is noble, really noble, which tries to tell that communities and societies are responsible for provisioning an environment in which members can fulfill their potentials. Oh by the way, the famous 10000 hours rule for mastery is the result of the Swedish psychologist Anders Ericsson studies and was merely popularized, by Malcolm Gladwell. Malcolm Gladwell writes very interesting and entertaining books. J.R.R. Tolkein writes very interesting and entertaining books as well. However, after reading Tolkein, I did not venture out into the world in search of hobbits, dwarves and elves to be my new friends, or worry about being attacked by trolls. Tolkein's books, while entertaining, have little connection to reality. Unfortunately, the same can be said about Gladwell. "Outliers" is a series of well-written and interesting essays along Malcolm Gladwell writes very interesting and entertaining books. J.R.R. Tolkein writes very interesting and entertaining books as well. However, after reading Tolkein, I did not venture out into the world in search of hobbits, dwarves and elves to be my new friends, or worry about being attacked by trolls. Tolkein's books, while entertaining, have little connection to reality. Unfortunately, the same can be said about Gladwell. "Outliers" is a series of well-written and interesting essays along the lines of New Yorker or Vanity Fair articles. However, their connection with reality is highly, highly dubious.This book is a big disappointment after "The Tipping Point" and "Blink", both interesting books that don't have the reader arguing with the author the entire way through. One main problem is that there isn't really an identifiable thesis in the book. It seems like Gladwell wants to say that the myth of the "self-made" person is not true, since every successful person has had help and lucky breaks along the way. Well, duh! But then he goes on to say that successful people spend 10,000 hours on their chosen area of success. Do they get any credit for that? Does working on something for 10,000 hours when you could be goofing off make you a bit "self-made"? In my book it certainly does.Take Bill Gates. Yes, he came from a rich family, had some breaks and some unique opportunities. But what about his former classmates who are now meth addicts or bitter failures who had similar opportunities, but didn't sieze them? Or those who simply were too lazy to put in 10,000 hours in front of the computer? Is Gates "lucky" that he had the drive to do that? So either the main thesis falls apart -- that if you are privileged and lucky you will be successful, or it becomes something completely prosaic, such as "Gates worked hard, but he had some unique breaks". Again, duh! That's life. Every person can identify positives and negatives in their own lives. It is the choice to overcome the negatives and to capitalize on the positives that makes the difference. If Gates hadn't found the computer lab Gladwell discusses, would he have just given up, or would he have kept on looking? I think that he would have kept looking until he found a similar opportunity.The science is also incredibly flimsy. He asserts - "Successful hockey players are almost all born in January - March". Well, wouldn't that apply to all athletes? Wouldn't somebody before Gladwell have figured that out? Where is the data from the NBA, NHL, NFL and MLB? It really is an example of inductive reasoning, not good science. Gladwell is made aware of a pattern with *certain* hockey teams in Canada, and then assumes that this small sample proves that if you are born in April or after, you won't become a good athlete. Maybe so, but Gladwell needs more data to prove his point.Another assertion is: "Asians are good at math because their ancestors were rice farmers - They come from a patient, hard-working culture". But perhaps there are other reasons that could explain the same thing: religious traditions, government, how education is structured. Hey, maybe Asians have a high tolerance for their own body odor and can spend more hours in the field than Europeans! I'm not seriously arguing that, but it is an example of Gladwell making a connection between two things that is far from proven.The book is best read as a series of colorful essays on some interesting topics. However, as a guide or explanation of success, it is an example of truly sloppy science and shoddy reasoning. True, successful people don't get there on their own. But everyone can review their lives and identify lucky breaks as well as unfair disadvantages. In the end, Gladwell doesn't explain success at all in a convincing fashion, and risks leaving the reader with the impression that fatalism is the only attitude to have towards their own success. Nothing could be further from the truth. "Outliers" those wildly successful people, for whom 'normal rules don't apply.' Are they just lucky, talented? Maybe...but, outliers may not be outliers after all...after reading the entire book, I was slapped by that at the very end. Gladwell looks closely at success, and those who seem to have waltzed into incredible success...Canadian hockey players, who just happened to have been born in the right month of the year; Bill Gates, who just happened to go to a school where the PTA moms bought a "Outliers" those wildly successful people, for whom 'normal rules don't apply.' Are they just lucky, talented? Maybe...but, outliers may not be outliers after all...after reading the entire book, I was slapped by that at the very end. Gladwell looks closely at success, and those who seem to have waltzed into incredible success...Canadian hockey players, who just happened to have been born in the right month of the year; Bill Gates, who just happened to go to a school where the PTA moms bought a new-fangled computer system. Mozart, who didn't hit his stride until ten years after he began composing...the Beatles! Their sound was born of the 10,000 hours of performing in Hamburg -- more than other groups could amass in years of playing.Success is timing, and hard work...10,000 hours of practice required. It's luck -- having the right family, having the right opportunities -- Gladwell's description: "a combination of ability, opportunity, and utterly arbitrary advantage...beneficiaries or some kind of unusual opportunity. "Gladwell's storytelling is so easy to fall into. We go with him anywhere...to a small town in Italy, to his own Jamaican family, and everywhere in between. I know Gladwell has an essay in TELLING TRUE STORIES, about narrative journalism, and I enjoyed reading this, more aware of the craft he practices...nonfiction storytelling.When Bill Gates admits he was very lucky, Gladwell hammers home that point. But to me, the 100,000 hour rule is what I'll take with me. Do you want to be the best? Put in the effort! Talent and opportunity can help, but success is hard work. I don't know about Malcolm Gladwell. I've read 3 of his books. All of them fine, but nothing special. All of them fairly superficial with nothing original or innovative. I think his books are very pop culture and should be read in the time frame (say within a year) that they are published. Too long after that and they become stale, not prolific or prescient. Gladwell is a very good and interesting writer, but I don't think his books have much depth or staying power.Almost 3.5 StarsRead on kindle I don't know about Malcolm Gladwell. I've read 3 of his books. All of them fine, but nothing special. All of them fairly superficial with nothing original or innovative. I think his books are very pop culture and should be read in the time frame (say within a year) that they are published. Too long after that and they become stale, not prolific or prescient. Gladwell is a very good and interesting writer, but I don't think his books have much depth or staying power.Almost 3.5 StarsRead on kindle. "If only I'd read this book earlier," the old man sighed. He shook his head sadly. "I was at the wrong end of the cut-off age. I'd have made a champion swimmer...". His voice trailed off."Hmmm. "He sighed again. "Then there's this 10000 hour rule. What the hell am I supposed to do about it now? The only thing I have 10000 hours practice is of scrunching my nose when my wife farts. And even that is more due to habit now. You get used to the smell pretty quickly." He shook his head again. "It's the "If only I'd read this book earlier," the old man sighed. He shook his head sadly. "I was at the wrong end of the cut-off age. I'd have made a champion swimmer...". His voice trailed off."Hmmm. "He sighed again. "Then there's this 10000 hour rule. What the hell am I supposed to do about it now? The only thing I have 10000 hours practice is of scrunching my nose when my wife farts. And even that is more due to habit now. You get used to the smell pretty quickly." He shook his head again. "It's the cabbages. She loves them too much. ""I guess. ""I wish I was born in a 'culture of honour'. If I had been, I would not have just stood there and nodded meekly when my boss told me that I was the love child of a donkey and a pigeon. I would have given him one - right in the kisser. Right in the kisser, I tell you boy. ""Er...but wouldn't that have landed you in jail? ""Ah, I would have done good in prison, boy. Would have run the prison library and made it famous, like that guy in Shawshank. ""Of course. ""I wasn't ever meant to be an outlier. Life dealt me the wrong hand." "Then how would reading the book earlier have helped? "He looked at me incredulously. "Why, it would have changed my life! I wouldn't have felt sad at my failures. I would have regarded them as inevitable. I would have waved the book at everyone who looked at me as a loser. I would have...I would have..."I was distraught. "Oh, Mr. Blake, why couldn't you have bought the book 35 years ago when it came out?" I felt really bad. This wasn't fair.He shook his head and sighed prodigiously. "Ah boy, that's the worst part. My boss gave me this book on my 30th birthday. But I hated him so much, I threw it away in the dustbin. "I burst out crying. This is not a feeling oriented review like those that seem to be getting esteem here. While this is a well-researched and easily readable book that makes some interesting points, most of its contents are pure common sense. In a world so highly populated with such strong inequities, of course there will be a lot of luck and chance involved with how someone turns out, aside from those that result from innate ability. You already knew that, right? So, shouldn't specific ideas and remedies be offere This is not a feeling oriented review like those that seem to be getting esteem here. While this is a well-researched and easily readable book that makes some interesting points, most of its contents are pure common sense. In a world so highly populated with such strong inequities, of course there will be a lot of luck and chance involved with how someone turns out, aside from those that result from innate ability. You already knew that, right? So, shouldn't specific ideas and remedies be offered in such a heavily lauded book? 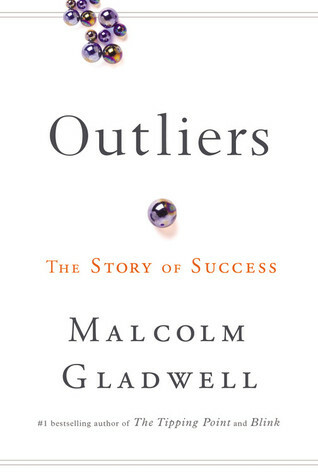 If Outliers had contained, along with it's excellent sociological perspective, some specific solutions, and had it also delved into some of the psychological aspects of success, it could have been a great book. But it did neither, and frankly, it isn't a great book.I'm not saying that Outliers didn't change my paradigm a little bit. It did. I now find myself taking environment and outside forces more into account when accessing others and their circumstances. But this shift in outlook is minor, because the premise of the book was already intuitive to me, and it probably is for you as well. All considered, I think three stars is what this book deserves. I'm starting to think that all Malcolm Gladwell books are the same thing - a rather ordinary/non-controversial statement about life which is padded with pretty neat examples and then praised as revolutionary, thus selling millions of copies.Main thesis is that social ability is a greater guarantee of success than mere intelligence. Well of course sociability can help. But life is not as simple as the pop-culture philosophers theorize.I am also distrustful of the means by which 'success' is measu I'm starting to think that all Malcolm Gladwell books are the same thing - a rather ordinary/non-controversial statement about life which is padded with pretty neat examples and then praised as revolutionary, thus selling millions of copies.Main thesis is that social ability is a greater guarantee of success than mere intelligence. Well of course sociability can help. But life is not as simple as the pop-culture philosophers theorize.I am also distrustful of the means by which 'success' is measured. These terms do not seem to be properly defined. For intelligence, Gladwell relies on IQ, which is an unreliable and discredited method for this job, at best.The main idea of the book is somewhat interesting, but the reasoning simply does not stand up to scrutiny. I wonder if it is my own paranoia, but I guessed that there is an undercurrent of anti-intellectualism in his books. Reason is not enough - your mere instinct and sociability can supersede them.Given 2 stars because the basic idea is not wholly false. In just one week, this book transformed a relatively normal woman into someone who's been saying, "Well, in this book I'm reading. . . you know, Outliers? Yeah, there's this section on. . . there's this part about. . . You should read this chapter. . . No, no, just wait here and let me read these 3 pages out loud for you. . . Have you read it? Oh, you haven't? Let me just show you this one page, it'll just take a minute! "I can't think of one reason why you shouldn't join me in my enthusiasm. The term I've coined for books such as these is "the illusion of erudition." We love the anecdotes, many a form of comfirmation bias---the author telling us what we want to hear (cha-ching)---and we feel oh so much wiser once the wheels of the plane touch down on the runway at our destination because of having read a book such as this on our flight.====================================The famous, or infamous concept of the 10,000 "rule" in this book is not real. In a 2012 paper in the British Jou The term I've coined for books such as these is "the illusion of erudition." We love the anecdotes, many a form of comfirmation bias---the author telling us what we want to hear (cha-ching)---and we feel oh so much wiser once the wheels of the plane touch down on the runway at our destination because of having read a book such as this on our flight.====================================The famous, or infamous concept of the 10,000 "rule" in this book is not real. In a 2012 paper in the British Journal of Sports Medicine, the lead author of the original study about the practice time of elite violinists, K. Anders Ericsson, ascribed the phrase’s popularity to a chapter title in Outliers, which, Ericsson wrote, “misconstrued” the conclusions of the violin study. Ericsson himself never used the number 10,000 or the term "rule." Gladwell made that up. Ericsson extended his study to sports. Author David Espstein reports on the results (next four paragraphs)....In fact, in absolutely every single study of sports expertise, there is a tremendous range of hours of practice logged by athletes who reach the same level, and very rarely do elite performers log 10,000 hours of sport-specific practice prior to reaching the top competitive plane, often competing in a number of other sports— and acquiring a range of other athletic skills— before zeroing in on one. Studies of athletes have tended to find that the top competitors require far less than 10,000 hours of deliberate practice to reach elite status. According to the scientific literature, the average sport-specific practice hours to reach the international levels in basketball, field hockey, and wrestling are closer to 2,000, 4,000, and 6,000, respectively. In a sample of Australian women competing in netball (sort of like basketball but without dribbling or backboards), arguably the best player in the world at the time, Vicki Wilson, had compiled only 600 hours of practice when she made the national team. A study of athletes on Australia’s senior national teams found that 28 percent of them started their sport at an average age of seventeen, having previously tried on average three other sports, and and debuted at the international level just four years later.Even in this age of hyperspecialization in sports, some rare individuals become world-class athletes, and even world champions, in sports from running to rowing with less than a year or two of training. As with studies of chess players, in all sports and skills, the only real rule is that there is a tremendous natural range.======The down side to the Gladwell "rule" is that you see many unhappy kids out there being ground through the requisite "hours" by parents hoping their children will get scholarships or maybe go pro. I've coached enough youth sports to know there needs to be some base talent to build on for a young person to excel. I've also seen many 12-year olds who were stars at that age, but who faded by age 16, no matter how many hours they put in.At the gym one day, I ran into a varsity high school football coach, whose team had just won the California state championship. I asked him about "the 10,000 rule. "He said: "it's ruined many kids' lives. "==============It struck me that Gladwell is like a prosperity Gospel preacher who tells people what they want to hear. And uses anecdotes that supposedly prove his points.I saw a couple of minutes of the most famous such preacher in the U.S. right now, Joel Osteen, who holds forth in a retrofitted basketball stadium in Houston. He began with: "God is faithful. That promotion you've been waiting for: it's just around the corner. That lifetime soulmate you've always been looking for is on the way to you right now. The bonus money you need to take a vacation: you'll get that check by Christmas. "Then he'll use some story, usually from the Old Testament, to illustrate. And throw in a couple of contemporary anecdotes. "I met a man....."What if these good things don't come true? The dark side is that you get blamed. Somehow you've incurred God's displeasure.So you got cut from the team? It must be because you only put in 9,500 hours of practice instead of 10,0000. This has got to be Malcolm Gladwell’s best book yet, and coming from a fan like me, that’s saying something! As the subtitle states, this is a book of success stories, and true to his usual style, Gladwell draws on a diverse and interesting set of examples and presents a unique thesis on the ingredients it takes to make a person a success. The first half of the equation is much like Carol Dweck’s thesis in Mindset: The New Psychology of Success . Hard work matters much more than raw talent. In This has got to be Malcolm Gladwell’s best book yet, and coming from a fan like me, that’s saying something! As the subtitle states, this is a book of success stories, and true to his usual style, Gladwell draws on a diverse and interesting set of examples and presents a unique thesis on the ingredients it takes to make a person a success. The first half of the equation is much like Carol Dweck’s thesis in Mindset: The New Psychology of Success . Hard work matters much more than raw talent. In the chapter called “10,000 Hours” he cites a study of music students which shows that the number of hours spent practicing is the key determinant in mastery. I found that very encouraging. If you want to succeed, spend your time practicing.But it’s the second half of the equation that makes his thesis unique, even though this part is somewhat discouraging. True, successful people have to put in many hours to master their craft, but they can only do that when the circumstances of their lives allow it. Now sometimes seemingly adverse circumstances can turn out to be an incredible advantage (Woo hoo! A whole chapter on the history of Jewish immigrants to America), but a genius in non-nurturing circumstances won’t make it no matter how talented he is (hence the depressing chapter on Chris Langsam, the man with the highest IQ in America.) As with The Tipping Point, I read this book to help me advance my career, but the main lesson it taught me was about parenting. Whatever opportunities I may have had or not had, used or not used, made me what I am today. And in many ways, I do feel I haven’t lived up to my potential, so I have to remedy the situation by putting in my 10,000 hours of practice, by becoming as efficient as a Chinese rice farmer (another particularly inspiring chapter). But the area in which I can make the biggest difference is for my kids. My job as a parent is to create practice opportunities for my kids to exercise their talents and interests. And if they become the people they can be, then all of us will be success stories.